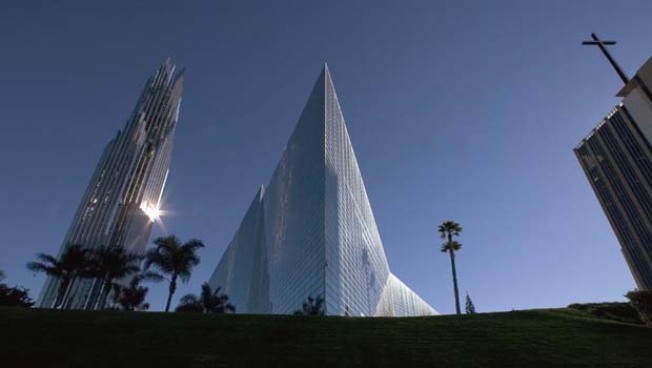 Sweetened bids for the famed Crystal Cathedral megachurch have led a federal bankruptcy judge to delay the selection of a buyer. Judge Robert Kwan will take up the issue again Thursday, after the board of the Crystal Cathredral Ministries has had a chance to consider the revised offers. The landmark Cathedral will be sold to pay some $50 million in debts. Chapman University and the Roman Catholic Diocese of Orange are competing for the opportunity to acquire the property. Chapman initially appeared to have the inside track with its $51.5 million offer. It would allow the Ministries to continue to use the Church with a lease back, while the University developed other areas of the property as a satellite health sciences campus. The Diocese envisions using the main worship space. Its offer provides for the Cathedral Ministries to relocated to the nearby parish church of St. Callistus. Last month, the Ministries tentatively agreed to sell the property to Chapman, but since that time the Diocese raised its offer to $55.4 million, and then again Monday to $57.5 million. Within hours, Chapman responded with a new alternative offer, introduced to the court with an impassioned plea by University President James Doti. The alternative would not increase Chapman's proposed purchase price, but would reduce the Ministries' lease back expense to only one dollar a month for 15 years. However, the alternative would reduce the initial right of repurchase to only a right of first refusal, should Chapman choose to sell the property. The Chapman alternative would also set up a bank account with $2 million as a reserve for disputed bankruptcy claims. The Chapman alternative was greeted with a burst of applause by members of the Crystal Cathedral congregation in the courtroom gallery. But within minutes, it was nearly derailed by concerns the reserve fund might not be adequate to cover the unresolved claims of the Ministries' founder, the Rev. Robert H. Schuller, and three of his family members. Their attorney, Carl Grumer, told the court that the ministries owe Rev. Schuller and his wife Arvella an annual payment of approximately $350,000, so long as one of them is still alive. Calculations of the MInistries' financial obligations had been based on a smaller annual figure, $290,000, that the Board had pledged in a resolution. Creditors' attorney Nanette Sanders suggested the Schullers had a chance to "be heroes" and "do the right thing," by limiting their claim. Outside court, Schuller daughter Carol Milner said her parents had sold many of their assets to support the MInistries and expressed concern that the Ministries not neglect her parents' needs in retirement.."
At the end of Monday's hearing, Judge Kwan determined that a reserve of $500,000 would be sufficient, which means that the Chapman alternative is considered feasible, and still in the running. It will be considered by the Ministries' Board at a specially scheduled meeting Wednesday, in advance of the next court date Thursday. Judge Kwan has given the Ministries' Board the authority to choose which bid to accept, so long as it covers all of the debts and required reserves. Rev. Schuller founded the Ministries in the 1950's. His preaching became known worldwide through the "Hour of Power" broadcast, which reaches about one million homes, and remains the Ministries' major revenue source. Now 85, Rev. Schuller retired as senior pastor nearly six years ago, but continues to preach and appear on Hour of Power once a month. The church opened its 10,000-pane glass cathedral in 1980. Revenues declined in recent years and unpaid bills mounted. The Cathedral could no longer afford to present its elaborate holiday pageants. The Ministries filed for Chapter 11 bankruptcy last year in an effort to continue operations while officials worked out a financing plan. With the sale of the Cathedral, it is planned for the Ministries to emerge from bankruptcy by the first of next year.